If I was forced to choose my favorite dessert - it would be Hello Dollies. It is actually one of the few things that I bake that I don't need a recipe to follow since I've made them so many times. They really are the perfect combination of ingredients and so quick and easy to make. They are actually my go-to recipe when I need to make something quick - I almost always have the ingredients on hand to make these. And they are so adaptable - I didn't have any plain graham crackers this time - so I used chocolate ones (and I think chocolate may have been slightly better than plain!). I also used a combination of walnuts and pecans - but you can use any type of nut you have on hand. 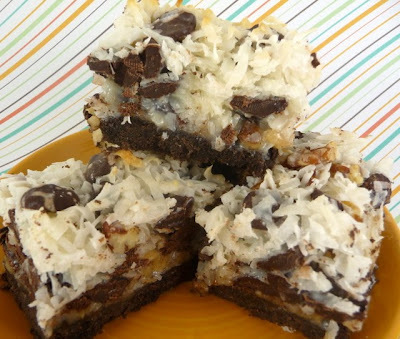 The part that can't be substituted is the coconut or the sweetened condensed milk. I love this dessert so much - I want to go make another batch right now just thinking about it. Enjoy! 2. Melt butter in a glass 8x8 inch square pyrex baking dish. Add in graham cracker crumbs and sugar and stir to combine. 3. Press graham cracker mixture firmly into the bottom of the dish. 4. 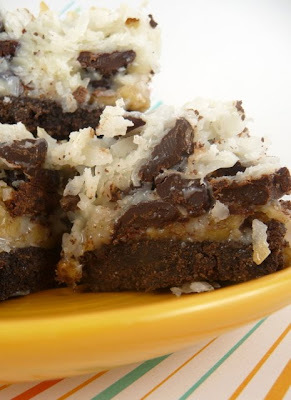 Layer nuts, chocolate and coconut. Pour condensed milk over the top - using a small rubber spatula to spread evenly. 5. Bake for 20 minutes or until golden brown on top (do not overbake). 6. Let cool - then serve! I don't really have a source for these - since I've been making them for so long this way. Christine! These were simply amazing. Matt ate them all and he doesn't even normally eat coconut.